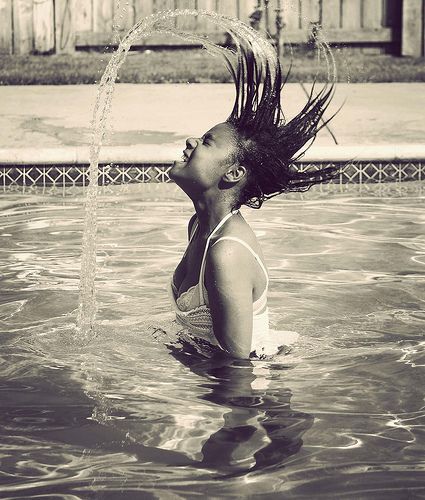 theHotness | Whipping My Hair! Here in NYC it’s been gloomy and gray for the past two days. Monday’s are hard enough to get motivated for me without rain and dark skies smothering my spirit and zapping my zeal. This morning when my clock radio went off that Eminem/ Rihanna song about love and domestic abuse started playing. Talk about a downer. Before I could press snooze I felt my body sag with blah weariness. By the time I got dressed and had my coffee, I was still feeling as if someone had ripped the IV outta my dry dehydrated weary veins. So I knew this situation called for some serious inspiration. I refused to spend today like I did yesterday: angry, teary eyed, and full of frustration. I pressed play on my iPod, removed the elastic band from my cornrows and got ready. “Whip My Hair” came blasting through my speakers and I whipped my Kalekelon weaved coif like that Asian chick from Soul Train. Finally, I was amped. I’m sure most of us could use a back rub, a raise, a weekend in the Caribbean, but sometimes all it takes is a song to get us going and to get out of our funk. Last year it was “Empire State Of Mind,” but these days it’s Willow Smith’s “Whip My Hair” that does my spirit good. On the cultural tip I love that this little Black girl is the one whipping her hair. And so maybe other girls who look like her with their beaded braids, cornrows, dreadlocks and afro puffs also feel inspired to whip their heads back and feel beautiful and free. With all the drama, stress and pathology that has come to define Black women and their hair, this song needs to be played at every Black salon in this country. But mostly I love that this song feels and sounds like pure kid-like fun. Like stomping in big wet puddles on rainy days and not caring about messing up suede shoes or cute pedicured toes. This song makes me feel young, eager and boundless. Before mortgage payments, student loans, parent teacher conferences, “that time of the month,” rent and car notes we all had this untouched wild freeness. I have to make sure I’m able to tap into that, especially on days like today. So which song gets you amped? Are you feeling Willow’s groove? OMG! On this day, my fellow “A” lady, I am definitely feeling your style of writing! I think the song is pretty cute. I agree, it’s perfect for salons! Love this! I agree that little black girls need something to bop their ethi-coifs to, big ones too! You’re right! It does get you in a good mood!!! I too was on the blah-ish side this morning, and then I went to read your blog and went directly in the right direction to youtube to see the fuss! It is SUCH a cute song! And definitely going to be on my “come on get happy” playlist! Thank you! Yup I love this song too and I love her individuality too!!! The song that makes me go is Mary J. Blige Just Fine–the lyrics say it all!!! I luv this little girl’s energy and attitude! It is so refreshing to see little black girls rock out without question. And this is a dope breakout song for her. My hype song that wakes me every morning is Cee-Lo Green’s “F*ck You!” The beat and instrumental is so high energy, I just jump out of bed smiling, singing and dancing. I luv it! @Tahana: Just Fine is a gangsta feel good song! @Sweetilocks: Yo I’ve heard from so many of my peeps that that Cee-Lo song is the bidness. Gotta check it out! And I’m so glad I’m back. Peace party people!